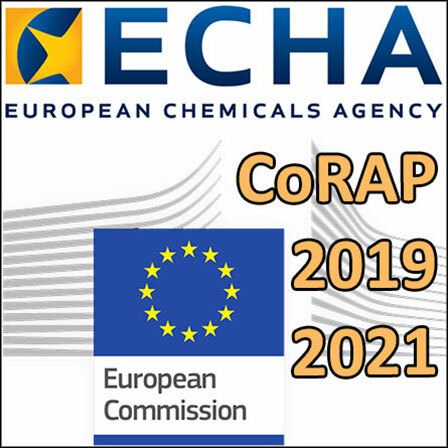 ECHA has adopted the updated Community rolling action plan (CoRAP) for 2019-2021 with 100 substances to be evaluated, some of which are used in cosmetics. The Member States have 12 months to evaluate the 31 substances specified for 2019. Registrants of the listed substances are encouraged to keep their registrations up to date and to contact the evaluating Member States. 19 Member States are to evaluate 100 substances over the next three years. For the 31 substances specified for 2019, the evaluating authorities have 12 months from today to carry out their evaluations. The aim of the evaluation is to clarify whether further information is needed to conclude whether a substance poses a risk to people or the environment. If necessary, the registrants will be asked to provide this information. The authorities will assess the suspected concern and, where relevant, initiate regulatory risk management actions. ECHA encourages registrants of the listed substances to coordinate their actions and to contact the evaluating Member State. Registrants are also urged to update their dossiers, especially for uses and exposures. They will have the opportunity to comment before any decision to request further information is taken. The draft decisions by the evaluating authorities will be reviewed by the other Member States and ECHA before the final decision is issued.